Yesterday, as you may know, was Groundhog day, and Punxsutawney Phil predicts we'll have an early spring. Here are 13 bits of Groundhog Day trivia. 1. Groundhog day first began in Pennsylvania in 1886. 2. Phil's namesake was King Phillip. 3. Prior to being called Phil, he was called Br'er Groundhog. 4. There is a German legend of Candlemas Day, which states, "For as the sun shines on Candlemas Day, so far will the snow swirl in May..." From these roots, Groundhog Day began. 5. Groundhogs were plentiful in Pennsylvania in the 1800's. 6. The early settlers beleived groundhogs were intelligent and sensible animals. 7. 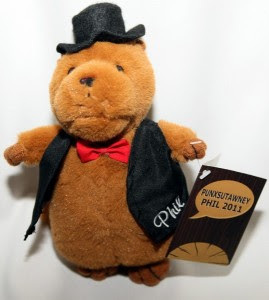 Phil has a club, and there are 58 chapters! 8. Groundhogs whistle when they are "courting" in the springtime. 9. Groundhogs really hibernate, but it's more like a coma than a deep sleep. 10. Punxsutawney Phil weighs about 20 pounds. 11. Most groundhogs live 6-8 years, but Punxsutawney Phil drinks magical punch every year, so he will probably live forever. 12. Membership in Phil's club is $10 per year. You can go here for tons of Groundhog Day information. And visit more Thursday Thirteeners here. This is a great idea for your 13. I learned something new about Phil, too! Thanks for sharing this bit of information. I had no idea there was so much to know about that little guy!! Where can I get some of that magickal punch? Oh admit it, I know you will be one of the very first people to buy that! Yesterday was my brother-in-laws Birthday, probably one of the only reasons I even remember that day.... oh & all the dumb news media.